Born in poverty and obscurity on May 19, 1925, in Omaha, Nebraska, Malcolm Little, the fourth child of Earl and Louise Little, rose to become one of the most dynamic Black Nationalist leaders of his time. He felt the sting of racism and was denied opportunity from his earliest years, from most, if not all, of the existing institutions of the day. Without the possibility, the hope, of upward mobility, with less than a ninth grade education, a life of crime was practically inevitable for young Malcolm. 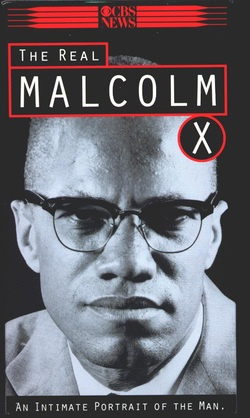 After his arrest and subsequent incarceration, Malcolm began reading a variety of literature made available to the prison by a rich philanthropist. Religion, race and world history were his favorite subjects. He also had time enough to review his old life-style. He began receiving letters from various family members. Two of his brothers, Philbert and Reginald, began writing him about a religious leader named Elijah Muhammad. At first he thought it was a scam to get his prison sentence cut short. But Malcolm began listening to his younger brother Reginald, who explained about his new faith. And Malcolm became fascinated with the doctrine taught by Elijah Muhammad. Soon after, he embraced the Lost and Found Nation of Islam, based in Chicago and headed by Elijah Muhammad. Malcolm received his X symbolizing his unknown African tribal name. It was also a candidates first step into the Nation. From the time of his release from prison, in 1952, until he left the Black Muslims, (as the followers of Elijah Muhammad were called in those days), Malcolm X became not only the organizations most articulate spokesman, but one of its architects and most ardent supporters. Malcolms only concern was to change the condition of his people, long victimized by social injustice and institutionalized racism. His approach to this state of affairs was to focus attention on them, by reminding the powers of his day of their responsibility for those conditions. He stressed the importance of not perpetuating such conditions because of self-hate, ignorance, and substance abuse. After falling out with Elijah Muhammad in 1963 and leaving the Nation of Islam, Malcolm undertook the journey that every person of the Islamic faith must, as a religious obligation. The Hajj or pilgrimage to the city of Mecca, Saudi Arabia. 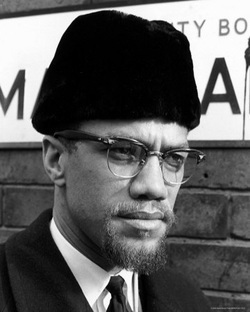 These two events culminated in a complete turnaround in Malcolms views on both his religion and his approach to the problems of racism and oppression of blacks in America. While performing the pilgrimage rites at the first house of worship built for the worship of the One God, Malcolm saw something he had only heard about, or dreamed of before: the true equality of man, as believers of all colors, and all social levels, stood to worship... the One God. Understanding the true message of Islam as taught by the Prophet Muhammad (p)1 , Malcolm now saw that the problems facing man were usually the direct result of the rejection of those beliefs and practices commanded by God from the earliest times. He also understood that all men could live together as one when they accepted the belief that the best of men are those who sincerely worship God and maintain the duties God has placed on men regarding their interaction and their relationship with one another. In his own words, as told to Alex Haley, Malcolm wrote Never have I witnessed such sincere hospitality and such overwhelming spirit of true brotherhood as is practiced by people of all colors and races here in this Ancient Holy Land, the home of Abraham and all the other Prophets of Holy scriptures. For the past week I have been truly speechless and spellbound by the graciousness I see displayed all around me by people of all colors. I have been blessed to visit the Holy City of Mecca ... There were tens of thousands of pilgrims, from all over the world. They were of all colors, from blue eyed blonds to black skinned Africans. But we were all practicing in the same ritual, displaying a spirit of unity and brotherhood that my experiences in America had led me to believe never could exist between the white and the non-white. America needs to understand Islam, because this is the one religion that erases from its society the race problem. Throughout my travels in the Muslim world, I have met, talked to, even eaten with people who in America would have been considered white, but the white attitude had been removed from their minds by the religion of Islam. I have never before seen such sincere and true brotherhood, practiced by all colors together, irrespective of their color. You may be shocked by these words coming from me. But on this pilgrimage, what I have seen and experienced has forced me to rearrange much of the thought patterns previously held, and to toss aside some of my previous conclusions. Despite my firm convictions, I have always been a man who tries to face facts, and to accept the reality of life as new experience and new knowledge unfolds. I have always kept an open mind, a flexibility that must go hand in hand with every form of the intelligent search for truth. I could see from this, that perhaps if white Americans could accept the Oneness of God, then perhaps, too, they could accept in reality the oneness of man and cease to measure, and hinder, and harm others in terms of their differences in color. What better testament could there be to the unifying power of Islam, the faith of over one billion people, comprising one fifth of the human race. This was the only faith Malcolm believed in, one that could rid the world of the evils of racism. Islam is a faith that rejects the ideas of inherent racial or nationalistic superiority and that acknowledges the nobility of all men as their birthright. This was the only religion whose message was powerful, yet subtle, enough to capture the heart of this man possessing an indomitable spirit, of resolute convictions and of faith in the Almighty Creator of the Universe. The change of his name from Malcolm X to El-Hajj Malik El-Shabazz symbolized his final stop on the journey from the darkness of erroneous beliefs to the truth and the light of Islam. There is one verse in the Glorious Quran, which not only restates the common origin of man, explains the division of humanity into nations, or race and tribes, tells us that the object and purpose of this division was also the ultimate unification of humanity, but goes a step further: It points out to us the one and only criterion, the only standard by which man is judged by god, and thus by which we should also judge our fellowman. As you will presently see, ( THIS CRITERION IS NOT HIS COLOR, NOR HIS RACE, NOT HIS SOCIAL STANDING OR CASTE, NOT EVEN HIS SKILL AND THE DEGREE OF HIS INTELLIGENCE ) . It is something which to achieve lies within reach of every human being, black or brown, white or yellow, rich or poor, if only he made an effort to cultivate it within himself. This verse of the Holy Quran is the answer of Islam to racism, an answer which, as far as the Muslim community is concerned, did not remain a pious exhortation but sounded the death knell of racial discrimination in the world of Islam as borne out not only by the example set by the Prophet Mohammed (p); but also subsequent events in the history of all Muslim nations and by the general attitude of the Muslims until the present day. The Muslim community would like to invite every one to the light of faith, reason and humanity, to the light of Islam!